Holiday lighting technology has been subject to considerable development and variation since the replacement of candles by electric lights. While originally used during the Christmas holidays as Christmas lights, modern electric light arrays have become popular around the world in many cultures and are used both during religious festivals and for other purposes unconnected to any festivities. Incandescent light bulbs have been commonly used in holiday lights until recently. These lights produce a broad-spectrum white light, and are colored by coating the glass envelope with a translucent paint which acts as a color filter. Some early Japanese-made lamps, however, used colored glass. While incandescent light sets are less expensive to purchase than similar LED sets, the operating cost is significantly more than those of the very low-wattage LEDs. Light-emitting diode (LED) holiday lights are quickly gaining popularity in many places due to their low energy usage, very long lifetimes, and associated low maintenance. Colored LEDs are also far more efficient at producing light than their colored incandescent counterparts. There are two types of LEDs: colored LEDs and white LEDs. Colored LEDs emit a specific color light (monochromatic light), regardless of the color of the transparent plastic lens that encases the LED's chip. The plastic may be colored for cosmetic reasons, but does not substantially affect the color of the light emitted. Holiday lights of this type do not suffer from color fading because the light is determined by the LED's chip rather than the plastic lens. White LEDs are similar in most respects such as power and durability, but utilize a two-stage process to create the white (polychromatic, or broad spectrum) light. In the first stage, the LED actually only produces one color of light, similar to any other LED. In the second stage, some of the blue or violet-blue is absorbed by a phosphor, which fluoresces yellow, imitating the broad spectrum of colors which our eyes perceive as "white". This is essentially the same process used in fluorescent lamps, except for the use of an LED to create blue light rather than excited gas plasma to create ultraviolet. Although LEDs are long-life devices, older or lower-quality strands of LED-based holiday lights can suffer from early failure. This is particularly so with blue ones, which are the newest and most expensive, and therefore prone to cost-cutting. Most LED-based holiday lights use copper wire which connects to the plated, copper-alloy leads of the LEDs. Having dissimilar metals in contact can result in galvanic corrosion inside of the lamps' sockets, causing them to stop working. 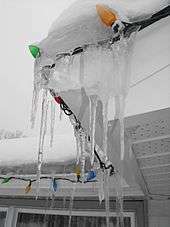 Some older sets of LED holiday lights have each LED permanently mounted in a non-removable weathertight base to keep out rain and other moisture, helping to prevent such corrosion; however, this prevents the user from replacing defective lamps. Many mini sets use standard 3 mm dome-shaped LEDs, and have a plastic cover over them to provide refraction, which is an important step in diffusing the unidirectional light they cast. These covers come in C5, C6, and C7 sizes (⅝, ¾, and ⅞-inch, or 16, 19, and 22 mm diameters, respectively) pointed "strawberries", G12 (12mm or almost ½-inch) globe "raspberries", and "M5" (5mm or 7⁄32-inch) pointed cylinders, equivalent to the T1¾ mini lights so common since the 1980s. For blue and green, these covers may have some fluorescence, leading to a lighter color. Other sets have 5 mm domes with no covers because these project light in one direction. Instead they have a cone-shaped indentation on the top to refract light out to the sides. Still other sets have covers like snowflakes (or for Halloween, pumpkins). There are also multi-LED screw-in bulbs which replace real C7½ and C9¼ bulbs and are much closer in brightness than the mini imitations. One drawback discovered to this technology for outdoor lighting, at least in North America, has been that squirrels have been found damaging them. The species must wear down their continually growing incisors by gnawing on hard objects. They apparently find the diode's durable plastic construction useful for this need, while its low power consumption means a minimal chance of electrical shocks to discourage them. Animal experts have suggested leaving edible hard nuts on the ground around lighting fixtures to distract the rodents with food that can also serve the same dental needs. Advances in LED projector technology have allowed outdoor projectors to become a viable option for holiday lighting. Projectors work like a home entertainment system but are instead fixed on lawns, trees, roofs, and other elevated surfaces. Most units are capable of projecting from a range of 10–15 feet (3.0–4.6 m), although other, more advanced, units can work from as far as 20 feet (6.1 m). Laser holiday lighting works via a simple laser that uses monochromatic light. Most units combine three colors: red, green, and blue. Units have fixed heads that operates on a simple motorized swivel that allows each point of laser light to appear to be moving. This has resulted in laser projectors being referred to by a number of names, including "firefly lights" and "laser firefly lights". Observers can notice that the laser points appear to be slowly floating between randomized points. Laser projectors have become popular throughout Canada and the United States due to their ease of installation and lower energy costs. Units can be installed with little more than an extension cord, which provides a simpler solution than what is offered by traditional holiday lighting. Laser Projectors can operate at temperatures of −4–104 °F (−20–40 °C), with each laser dot rated at less than 1 mW. Most units function with standard domestic mains electricity. Fiber optic technology is also used in holiday lighting, especially by incorporating it into artificial Christmas trees. Incandescent lamps or LEDs are located in the tree base and many optic fibers extend from the lamps to the ends of the tree branches. Bubble lights are a type of incandescent novelty light that acquired some popularity during the 1950s. Their main feature is a sealed glass tube with a colored bubbling liquid inside, created by the heat from the incandescent light. The fluid within the vial was originally a lightweight oil, but now is methylene chloride for a more consistent bubble effect. While the idea was first demonstrated by Benjamin Franklin, the idea was adapted for use in Christmas lights. They were invented by Carl Otis in 1935, who sold the patents to the NOMA Electric Corporation. There is a long story involving patent fights. Bubble lights can still be purchased online and in stores to this day. A number of light sculptures feature in this elaborate display which surrounds a Nativity scene set in a basement garage. Lights are sometimes mounted on frames—typically metal for large lights and plastic for miniature ones. These were first used for public displays on lampposts, street lights, and telephone poles in cities and towns. For public displays large C7 bulbs are generally used, but by the 1990s light sculptures were being made in smaller form with miniature lights for home use. Consumer types now tend to come with a plastic sheet backing printed in the proper design, and in the 2000s now with nearly photographic quality graphics and usually on a holographic "laser" backing. Public displays often have outdoor-rated garland on the frame as well, making them very decorative even in the daytime. Places where notable displays of light sculptures may be seen include Gatlinburg and Pigeon Forge, Tennessee. On a smaller scale, one of the most popular light sculptures is the sparkleball. Sparkleballs are handmade globes made from threading holiday lights into a sphere built of plastic cups. The cups are joined by soldering, cable ties, or with a hand stapler. Usually spotted individually on front porches at Christmas, the residents of North Yale Avenue in Fullerton, California have made a holiday tradition of hanging 450 sparkleballs from the trees lining their street. A variety of sizes, shapes and colours can be seen among these lights. Note that the following may be particular to North America, and may vary in countries with mains other than 120 volts. Christmas lighting began with small C6 bulbs — where the C means "cone" for the candle flame shape and the 6 indicates the diameter measured in eighths of an inch, ¾ inches (19 mm). These were on a miniature candelabra screw-base, now designated E10 (Edison screw, 10 mm). Replicas of these bulbs are now produced as miniature strings, usually with the entire bulb replaced, but sometimes with a decorative cover with regular bulbs inside. These bulbs tend to be transparent white or colors, and are often ornately designed with crystal-like patterns. Later bulbs called C7½, have diameters of seven and a half 1/8th inches ( 15⁄16 in, or 24 mm) using an E12 candelabra base; however, these have a blunt shape (and should therefore be called B7½, or B24). Mixing metric and English units, there are also now G30 globes which are 30 mm ( 1 3⁄16 in, or G9½) in diameter using these sockets. These are still used for the classic look or even retro style, and use about five watts each. Older bulbs drew 7½ watts of power, and were reduced to save power. Early bulbs, as well as some new antique reproductions, are made in various shapes and then painted like Christmas ornaments. Bubble lights and twinkle bulbs also come in this size. Outdoor-only bulbs are designated C9¼ ( 1 5⁄32 in, or 29 mm), and have a similar blunt shape as the C7½, but use an E17 "intermediate" base. Some modern versions of these strings are now listed for indoor and outdoor use. These bulbs are rated at about seven watts each, and are available in a globe shape, designated G40 (40 mm, or 1 9⁄16 in). Some of the blunt-shape bulbs now come painted with designs, or swirled in more than one color. It is now very difficult to find twinkle bulbs in this size. The four most common bulb sizes used in the United States. From left to right: "rice" style LED (0.057w), T1¾ "midget" (0.5w), C7½ (5w) and C9¼ (7.5w). Quarter shown for size comparison. Standard mini lights are T1¾, indicating that they are a tube shape 7⁄32 inches (5.5 mm) in diameter. Larger mini bulbs, which began appearing around 2004, are about twice this size, but are still very uncommon. Both types, along with most of the candle-shaped ones, are pinched-off at the tip rather than the base during manufacturing. Most contemporary miniature light bulbs have an internal shunt that is intended to activate when the bulb's filament burns out. The shunt closes the circuit across the bad filament, restoring continuity, which allows the rest of the string to remain lit. However, if one shunt fails to close properly, the whole string will fail to light. Other miniature types include globe-shaped "pearl" and smaller "button" lights, which are often painted in translucent or pearlescent colors. "Rice" lights are tiny, like a grain of rice, and can even have a subminiature base, if they are not already fixed permanently to the wires (on low-voltage sets). Rice lights are typically transparent, although colored variations do exist. They are intended to create tiny points of light, and are suitable for decorating miniature models, small wreaths, and other similar situations in which even "midget" T1¾ lights may be too large. LED lights, which are encased in solid plastic rather than a hollow glass bulb, may be molded into any shape. Because the LED casts light in only one direction, the most common way LED lights are designed, even "plain" sets having some sort of crystal pattern to create refraction. Many bargain brands have dome-shaped LEDs which focus the light so that it's sharply visible when viewed head-on, but almost invisible from a perpendicular direction. This has both advantages and disadvantages, depending on one's decorating needs. If a small LED bulb size with wider viewing angle is desired, wide-angle LEDs are available. The body is cylindrical with a concave conical depression, instead of a dome-shaped lens at the tip, to cause wider distribution of light. All miniature bulbs, including some LED sets, have a wedge base, though their designs are inconsistent with one another, making it somewhat difficult for the average consumer to change bulbs. To replace a bulb, the plastic base of the bulb must usually be changed by straightening the two wires and pulling the glass part out. Most replacement bulbs do not even include the bases anymore, despite getting only ten in a package and being charged nearly half the price of a new string of 100. For this reason, many Americans treat miniature holiday lights as disposable. In addition, colored lights tend to fade with even brief exposure to weather. Many LED sets are permanently wired, with bases that look like conventional pull-out bulbs. Traditional C6 bulbs were typically 15 volts, and used in series strings of eight bulbs, or multiples of 8. The use of eight bulbs (120 volts for 8 lamps equals 15 volts per lamp) gives each lamp the rated voltage for proper brightness. Later sets used nine bulbs on a string to increase the life of the bulbs by reducing the voltage each lamp received (120 volts divided by 9 lamps = 13 volts per bulb) but not significantly reducing the light output of the bulbs. Large C7½ and C9¼ bulbs typically come in sets of 25, though bubble lights come in sets of seven, and some non-holiday sets come in ten or twelve. Sockets are usually spaced about one foot (30 cm) apart, and are clamped to the wire with an integrated insulation-piercing connector. Some older parallel sets had 15 bulbs, as do some of the newer globe sets manufactured today. Both of these bulbs are designed to run on 120 volts AC and the light sets that use them are wired in parallel. This house in Cincinnati, Ohio is well known in the area for its traditional light display. The only types of lights used are mini, C7, and C9. Special wiring was to be installed to light the 125-foot-tall (38 m) pine tree with C9 bulbs for the 2007 display. Miniature lights first came in sets of 35 (3.5 volts per bulb), and sometimes smaller sets of 20 (6 volts per bulb). For a short time, these early miniature lights were manufactured using E5 screw bases, rather than the current wedge base and were called "Italian lights". Sets of ten (12 volts per bulb) were made for very small trees, but are quite hot, and are now usually used for tree toppers only. This number is convenient for stars, which have a total of ten points (five outward and five inward), and often have another light in the middle, occasionally on both sides. Incandescent miniatures now usually come in sets of 50 or 100 (which contains two circuits of 50) 2.5 V 170 mA bulbs, though decorative sets with larger bulbs (C6 or pearl style) typically come in sets of 35 or 70. Several "extra-bright" sets also use 70 or 105 bulbs, keeping the per-bulb voltage at 3.5 instead of 2.5. LED sets can vary greatly. Common is a set of 60 (2 volts per bulb), but white LED sets use two circuits of 30 (4 volts per bulb). Multicolor sets may have special wiring, because red and yellow require less voltage than the newer blue-based ones (blue, emerald green and fluorescent white), but typically come in sets with a multiple of 35. Battery-powered sets typically come in 10 or 12, and can use standard 2.5 to 3.5-volt bulbs because they run two batteries, totaling three volts or less. LEDs are becoming increasingly common as they greatly prolong battery life, but because they also last longer they are often soldered directly to the wires, making up for some of the increased cost of the newer LEDs. "Rice lights" are often made this way as well, and likewise may also have more bulbs per set, as they draw somewhat less power per bulb than other incandescent lamps. Controllers can be set up to change flashing or animation styles by pressing a button or turning a dial on the unit; others have only one pattern, but the speed of this pattern can usually be adjusted by turning a similar dial. Most multi-function sets feature eight to sixteen moving light functions. Some very common functions are fading and chasing. More extravagant and less common functions are stepping on and two-channel flashing. These lights usually come in sets of 140 or 150. This is because to give the chasing effect, bulbs must be arranged in four circuits of 35 (equals 140) or three circuits of 50 (equals 150). These light sets use even less power than a regular set of 150, because the lights are not always on, and therefore the bulbs do not get as hot. Usually, computerized sets cannot be connected end-to-end. However, some newer sets contain special miniature plugs – a female jack is located at the end of the set, and a male plug is located between the control box and the beginning of the actual lights. By disconnecting the control box from one set, it can now be plugged into the end of an identical chasing set to produce a longer strand of chasing lights. These plugs generally have a twist-on locking feature similar to that found on garden hoses. Computer-controlled holiday displays are becoming more and more common today. For instance, a display in Texas uses a PIC microcontroller-based dimmer scheme, and also refers to dimming controllers that people have built based on this scheme. The designs all use mid-range PIC microcontrollers, are generally modular in units of eight channels (dimmable circuits), and use medium-speed, daisy-chainable, one-direction serial communications for input. Most controllers do not have stand-alone show sequencing capabilities, and rely on a separate computer (usually a PC) to send it real-time sequences of dimmer commands. There are now several companies making equipment to do this, some are Light-O-Rama and HolidayCoro. Many animated displays now use RGB lighting. A control technology being developed in Ottawa, Canada that enables multiple homes to link up over the Internet in-real time. A central Web site initiates the timing using Network Time Protocol to keep the local computers synchronized, and each location has a small Java program that controls a device which interfaces with the USB port to which one's holiday lights are connected. In this way, anyone online can "plug in" to this network and at their discretion, working independently or synchronized, engage their holiday light display on a global level. This private residence in Jamaica Plain, Boston displayed 250,000 lights in 2006. The electric utility company installed special wiring; the electric bill was $2,000 per month. Incandescent (midget) or LED-based sets usually have each lamp connected in series to be powered without a transformer in the set. Screw-base C7 and C9 light sets use line voltage (120 volt) bulbs and are wired in parallel. LED-based sets use a current-limiting resistor to reduce the current supplied to each LED. Neon-lamp-based sets have lamps connected in parallel, each with its own current-limiting resistor. Battery-powered sets are also wired in parallel. Some incandescent or LED-based strings use a power supply transformer with lamps connected in parallel. These sets are much safer, but there is a voltage drop at the end of the string causing reduced brightness of the lamps at the end of the set. The reduced brightness is, however, less noticeable with LED-based sets than incandescent sets. Power supplies with integrated plugs may make the set difficult to connect in certain places. A line-operated AC string with a male plug on one end and a female socket on the other end can be conveniently connected end-to-end with other similar strings. The gauge of wire used, current rating of the fuse (if present) and the power consumption of each string will determine how many strings can be safely daisy-chained this way, or whether the end string will have diminished voltage and brightness. The number of strands of continuous light sets that may be safely daisy-chained in sequence varies based on whether the lights are LEDs, ordinary miniature light bulbs, or the larger C7/C9 type light bulbs. Other factors include the voltage of the set and the size of the wiring in the set. Those with questions should consult the manufacturer's instructions or an electrician. Most light sets come with built in fuses to help protect against overheating and to prevent household fuses or circuit breakers from being tripped. If a fuse blows, the strand must be unplugged and the number of strands must be reduced. If the strand has nothing attached, or has blown repeatedly, it may contain a short circuit and should be repaired or discarded. An episode of the Discovery Channel television show MythBusters covered the possible fire danger from holiday lights. ↑ Nelson, George. "The Evolution of the Series-Type Christmas Light Bulb". The Antique Christmas Lights Museum. Archived from the original on 2006-10-20. Retrieved 2006-11-12. ↑ EarthEasy (8 November 2016). "Choosing an LED lightbulb". EarthEasy. Eartheasy. Retrieved 8 November 2016. ↑ "Squirrels go nuts for tasty Christmas lights". CBC News. 2008-12-04. ↑ Edwards, Phil (8 November 2016). "Guide to Laser Projectors". Laser Christmas. Retrieved 8 November 2016. ↑ Edwards, Phil (8 November 2016). "Guide to Laser Christmas Lights". Laser Christmas HQ. Retrieved 8 November 2016. ↑ "How Fiber Optics Work". How Stuff Works. How Stuff Works. 8 November 2016. Retrieved 8 November 2016. ↑ Nelson, George. "The History of Bubble Lights". The Antique Christmas Lights Museum. Archived from the original on 2006-11-24. Retrieved 2006-11-28. ↑ "How Christmas Lights Work". How Stuff Works. Retrieved 2006-11-12.